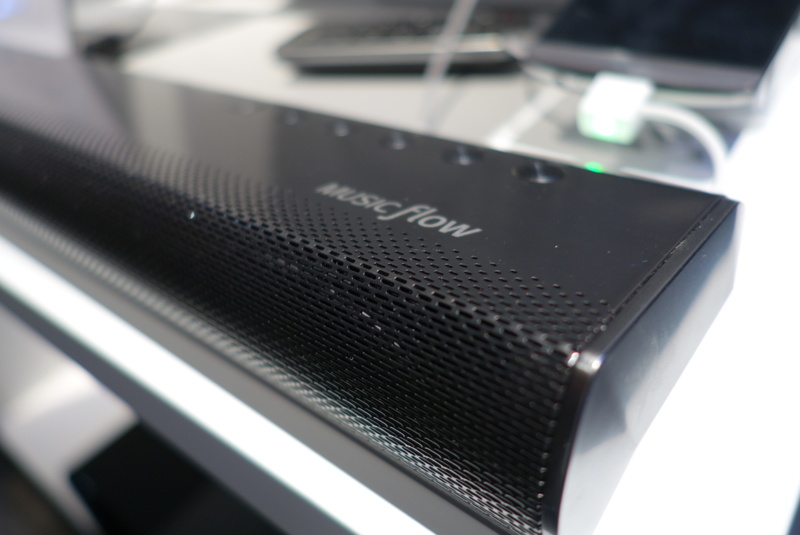 Is LG’s Music Flow The Sonos-Killer It Could Be? 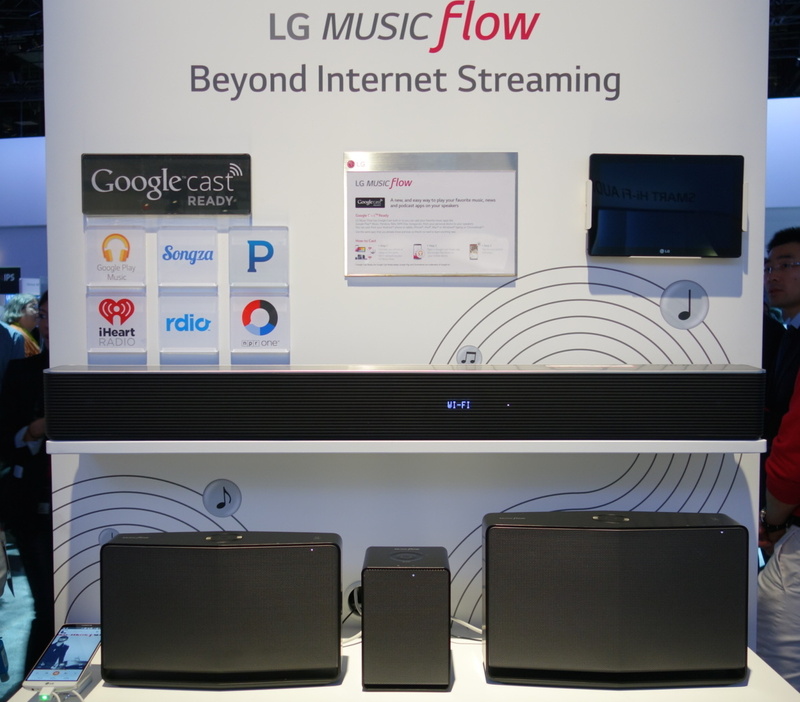 The higher-end Music Flow products from LG. 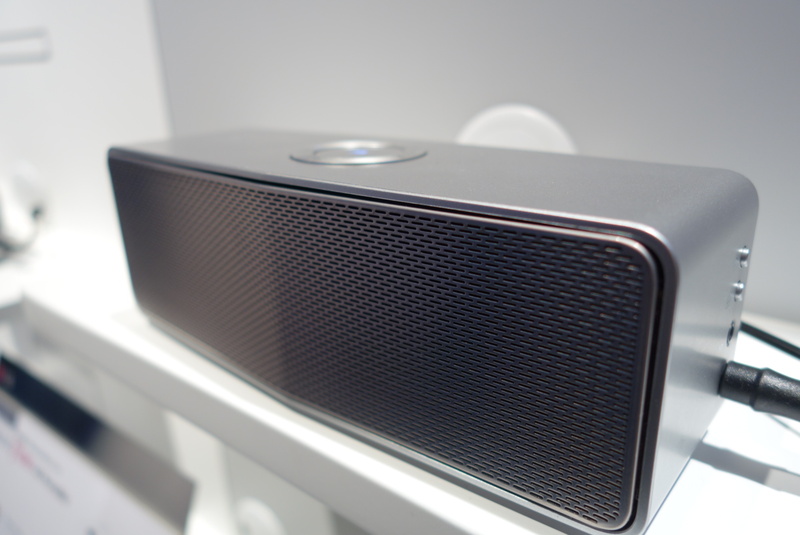 The sound bar is a 7.1-channel surround speaker with an included subwoofer. No prices available on any of these yet. How much less is still a matter that’s to be determined, as LG isn’t discussing pricing on most of the Music Flow products just yet. The one item there is a price on is a 4.1 channel surround sound bar (with included bluetooth-connected subwoofer) that a rep says will go for $399. According to this rep, when you combine that sound bar with two H4 portable Music Flow speakers, you get a surround sound setup that will cost you around $1,000 less than a comparable Sonos system. 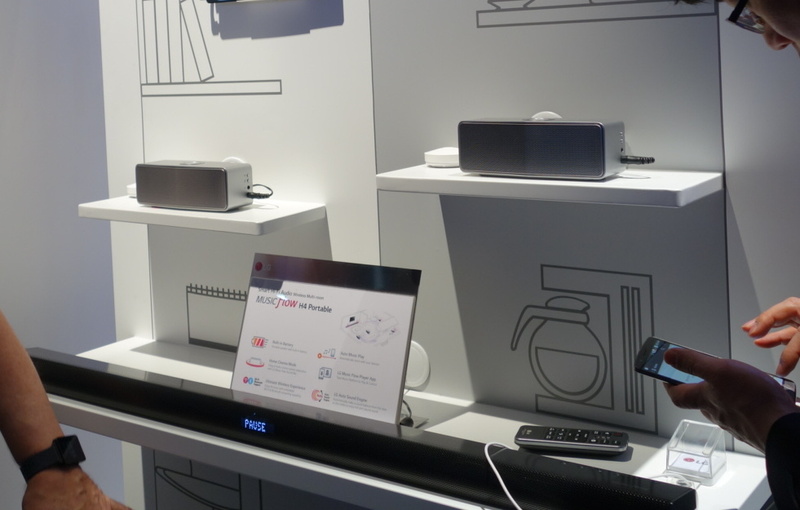 An LG rep says that this setup — with the $399, 4.1-channel sound bar and two portable Music Flow speakers, would cost around $1,000 less than the comparable $1,800 Sonos surround setup. A closer look at the 4.1 sound bar. No word on how much that price gap narrows when you use the higher-end Music Flow satellite speakers for your surround system. Beyond price — which is still a theoretical advantage over Sonos as no firm numbers have been announced — one advantage that Music Flow might have over the competition is variety. In addition to the 4.1 sound bar mentioned above, LG is going to release a 7.1 channel sound bar (also with included subwoofer). The H4 portable speakers from LG offer the portability that Sonos does not currently bring to its lineup of products. The portable speakers we mentioned above also add something that Sonos has yet to bring to market — the ability to take your system anywhere you want. These speakers have a rechargeable battery that LG claims can last for upwards of 6-7 hours of continuous play before needing a charge. The portability aspect isn’t just about bringing the speakers to the beach or to a picnic, where they’d be little different than the many bluetooth speakers already available, but also about being able to move the speaker around the home without hunting for a plug or worrying about extension cords and surge protectors. The one thing we can’t tell you about Music Flow is what it sounds like. While LG was playing music on the speakers, the crowd noise here at CES makes demonstrating home audio almost pointless unless it’s done in a sealed environment. We’re sure our colleagues at Consumer Reports will eventually get these speakers in the lab at some point to see how they truly stand up to the competition. Next Unlocked iPhone 6 And iPhone 6 Plus Now Officially Available In The U.S.
Next Up: Unlocked iPhone 6 And iPhone 6 Plus Now Officially Available In The U.S.